Early man ran with the animals, lived with the animals, and was one with the wild symphony of the natural world--a time fondly remembered as the Garden of Eden, or Idunn as it is known in Norse mythology. But as humanity shifted from a hunter-gatherer lifestyle to one of farming and cities, embracing the modern worldview of man’s superiority over nature, we began ignoring our innate connection with the Earth. Now we are waking up to what we’ve lost, yearning to heal our relationship with the Earth and rekindle the oneness with nature that we naturally enjoyed as children. Drawing on the work of Felicitas Goodman, Thomas Berry, Ervin Laszlo, and other important voices calling for recognition of our connection with all life, author Nicholas Brink shows how ecstatic trance can return us to profound union with our Great Mother, the Earth. 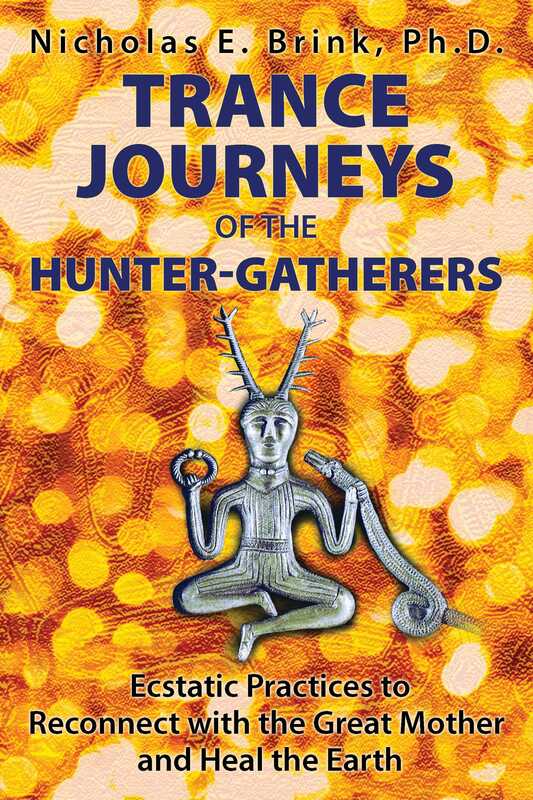 He details the specific healing and spiritual powers of trance postures and rituals from a variety of hunter-gatherer societies, including ancient Celtic, Norse, Native American, and South American traditions. He explains how the shamanic techniques of ecstatic trance allow us to access waking-dreamlike visions where we can connect with animal spirit guides, the six directions, and the seasons and discover ways to help heal the Earth. We can shape-shift to see through the eyes of each species of flora and fauna, interacting with life-forms in the skies, on land, in the seas, and underground, as well as journey to the realm of the dead to meet our ancestors. Sharing personal trance experiences of healing, spiritual connection, and divination, Brink shows how these practices enable us to create personal rituals to maintain oneness with all life. He reveals the spiritual power of being one with your environment and experiencing the spirits of everything around you. And, as we reconnect with the spirit of the Earth, we can once again experience the world not only as alive but also enchanted. When you start experimenting with ecstatic postures, one early experience is to find a spirit guide that in some way leads you to new discoveries about yourself. Hunters-gatherers, ancient and contemporary, see the world as full of spirits--spirits of specific animals, plants, or other substances of the Earth with personalities from which they have something to learn. Clan names are generally an animal that is considered an ancestor of the members of the clan. This animal is protected by the clan and is considered a guide in their lives. The clan members are sometimes extended family, but members can be assigned by various methods, such as the result of a vision quest or a specific rite of passage in the person’s life, by the person’s role in the community, or by some other means. A person may have more than one spirit guide. These spirit guides are central in the rituals, celebrations, and dances of the tribe as a way of showing the guide honor and respect. The costumes and masks worn by tribe members during these rituals are generally of their spirit guides and are to call these spirits to join them in the rituals. Spirit guides have specific personalities that have something to teach us. For example, a common personality assigned to the coyote is a playful trickster and to the bear a nurturer and healer. Trees are often experienced as the axis of life and rivers are a guide to our flow of life. Paths across the Earth can also be spirit guides. In this chapter we will examine some spirit guides--our four-legged, winged, and finned brethren as well as other earthly kin including reptiles, insects, trees, and rivers--and how they lead us to a greater valuing of being one with nature. Trees are typically the Tree of Life or the axis of a person’s life. The tree’s health, strength, and rootedness may reflect the health, strength, spiritual height, and rootedness of the person. 6-18-08: I walk into the woods following the song of a wood thrush. The woods become more tropical as I walk, more dense with large leaves and very tall trees. The path narrows and widens alternately. At some point I climb up a tree to the top and look out. I am above the tree, higher than the other trees. I step out into the air with enormous strides and walk until I stop and climb down another tree. I find myself in another place; it’s Hawaii where I lived in the late 1960s and I’m on the beach. I wander around a few of my old haunts, especially where I lived the last year I was there. Then I am up in the top of another tree I’ve climbed, and again I step out into the air and walk until I stop. This time I’m in Japan. I do this for three more places, Bangkok, Kabul, and Paris. From there I wind up at my parents’ house. I climb down the tree that was in the middle of the backyard. In each place there is a sense of eased anxiety, of possible healing. I return to hearing the wood thrush. These trance experiences are written down right after they occur and I often e-mail them again years later so that the person can reflect on the experience over time. In response to my email five and a half years later Violet elaborated on the meaning of her experience: “I do remember this one--climbing up into the trees following the wood thrush song (my favorite bird call) and stepping off the tree in Hawaii. My journey from there to Japan, Bangkok, Kabul, Paris, and on to my parents’ house is actually the reverse of what I did when I was 21. I left my parents and went to Europe where I lived in Paris. After a few months, I took off with a new friend to Japan via Kabul and Bangkok among other places, but Kabul and Banagkok were two of the most memorable. I wound up in Hawaii where I lived for four years. 3-27-11: I slide into the opening at the base of a tree and four men I have been with in many previous trances are sitting on two roots that form a circle in the cave. We sit silently in the circle, then one stands and starts climbing up the root and we follow. We are all wearing bear skins, and as we emerge in the middle world, we become bears and walk in a circle around the tree. I can feel myself swaying as I walk like a bear. Then the leader climbs the tree and we all follow him into the upper world where we sit in a circle around the tree on branches. Then we come down again as men and the four men walk away in the four directions, leaving me at the tree--my center of life. In this defining experience I realized for the first time that the four men I have frequently visited are my spirit guides for the four directions, but also the tree was the guide leading me to this discovery as we climbed it to each level--underworld, middle world, and upper world.